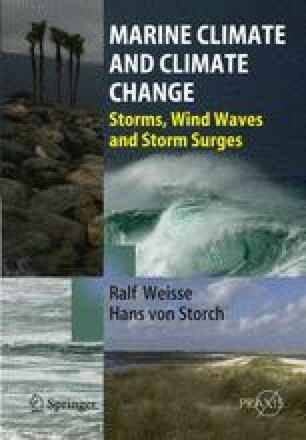 In this chapter we introduce and describe some of the marine weather phenomena that may cause high impacts at sea or in coastal areas. Naturally, high wind speeds play a crucial role and they are associated with all the phenomena discussed. We start with a description of mid-latitude cyclones and storm tracks (Section 2.2). Mid-latitude cyclones form along the polar front in both hemispheres and preferably propagate eastward. The regions that, on average, experience high mid-latitude cyclone activity are referred to as storm tracks. Mid-latitude or extra-tropical cyclones are to be distinguished from tropical cyclones that preferably form over the tropical oceans within a latitude band ranging from about 5° to 20° in both hemispheres (Section 2.3). Both mid-latitude and tropical cyclones are associated with high wind speeds that are responsible for high-impact variations of sea surface height. The latter comprise wind-generated waves at the sea surface (Section 2.4) and storm surges (Section 2.5). Changes in mean sea level and tides are also addressed in Section 2.5. Although they are not related to high wind speeds, their effects may add to wind-induced variations of sea surface height and thus may significantly enhance the risk of flooding in coastal areas.